Great Play of Superior - Get Involved. Make Friends. Enjoy Motherhood. A MOD Moms Business. 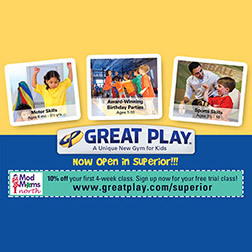 Great Play makes it fun for kids, ages 6 months to 12 years, to develop motor skills, sport skills, fitness and coordination in our amazing, patent pending Interactive Arena. “Great Play!” Our name (in addition to representing the great time children have when they visit us) comes from that ultimate feeling of success for anyone playing a game or sport – having friends, fans and teammates clapping and shouting “Great Play!” from the sidelines. We want every Player to develop the skills and confidence to experience that feeling, so they’ll want to play and be physically active for life. Join our Insider’s List on the homepage to keep apprised of new information.